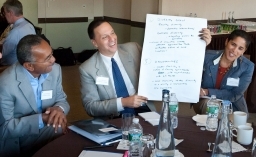 From left: Michael Reed, vice president for strategic planning and institutional diversity at Williams; Ron Liebowitz, Middlebury College president; and Shirley Collado, dean of the college at Middlebury, at LADO's Presidents Forum in September 2012. Photo by Lee Wexler. MIDDLEBURY, Vt. ― Three liberal arts colleges ― Middlebury, Williams and Connecticut College ― have joined together to launch a new strategy to increase diversity among faculty. These institutions will lead a three-year project, known as the Creating Connections Consortium (C3). Supported by a $4.7 million grant from The Andrew W. Mellon Foundation, C3 will implement its strategies to accelerate recruitment of faculty with historically underrepresented backgrounds (first-generation college students, or students who have succeeded despite societal, economic or academic challenges). A fourth institution will join Connecticut College, Middlebury and Williams to lead the initiative in year two of the project. Working with the other 23 member colleges of the Liberal Arts Diversity Officers Organization (LADO), C3 will formalize a reciprocal relationship between these institutions and Columbia University and the University of California, Berkeley. For years relatively isolated liberal arts colleges have struggled to find ways to hire and retain diverse faculty. At the same time research universities have faced a similar dilemma trying to recruit diverse graduate students from liberal arts colleges, where a lack of underrepresented faculty mentors reduces the likelihood of these students choosing to pursue careers in academia. Networking: C3 will host an annual summit at a LADO college where underrepresented students from LADO institutions will meet with doctoral candidates from Berkeley and Columbia to learn firsthand about research and challenges they face in the academic environment. Faculty from LADO schools will conduct mock interviews and discuss current employment opportunities with these graduate students. Cohorts of Postdoctoral Fellowships on Liberal Arts Campuses: Three to four two-year post-doctoral fellowships on three to four LADO campuses will allow talented faculty members to immerse themselves in the liberal arts environment with strong support from their cohort and faculty mentors. Internships for Undergraduates: Underrepresented students from LADO campuses may apply for eight-week summer research internships at Columbia and Berkeley, working closely with a faculty mentor of a similar background. Faculty Exchange Program: All LADO schools will explore exchange opportunities so that underrepresented faculty members from the university partners can provide lectures, collaborate in research, and possibly serve as visiting faculty across LADO campuses. Adding New Partners: C3 plans to add a third research university partner by 2014 as a step toward raising the number to five once the program is well established. Assessment: The C3 initiative includes a partnership with the Center for Institutional and Social Change at Columbia Law School. The Center will provide assessment strategies for C3 colleges and university partners and help identify ways to implement successful recruitment and retention practices so they become routine at the participating institutions. A detailed description of C3’s strategies is available here. Administrators at Columbia and Berkeley expressed their enthusiasm for the C3 project and the opportunities it creates.